The Zaya-Ruzo Universal Copper-Wound Nylon Strings are no longer being manufactured. I have a supply of some of the sizes still available. These professional quality strings are made of nylon cord that is wound with silver plated copper wire. I am also set up to make my own strings up to 140 cm in length. Enquiries for custom-made strings are welcome. Now you can choose from a variety of sizes for your lautenwerck, lute, guitar, chitarrone, theorbo, cittern, vihuela, vielle, rebec, harp, ukulele, hurdy-gurdy or any other instrument that uses this kind of string. Massachusetts sales add 6.25% sales tax. Prices include packing and shipping to USA. Inquire for quote to other countries. To determine the size string that you need for other instruments, download and print out the Graphic Universal String Calculator PDF document (1 MB). Cut out the musical note bar along the two dotted lines. Cut out the half circle tabs below the graph and slide the note bar under these tabs. Slide the bar so that the black arrow points to the sounding length of the string you want to replace. Now find the note along the bar and follow it up to the string that will give you the tension needed. The strings are identified with numbers S-6-1 up to S-12-7. Middle C is c' at 261.6 hertz which is modern pitch. If you need notes lower than C 65.4 hertz you can extend the note bar in the bass or mark a new black arrow 108mm to the right of the existing arrow and now the notes are transposed down an octave. You can also extend the length of string at the right. Try to estimate the correct spacing. The price for sizes listed on Calculator is $6.00 per meter. 140 cm lengths are $8.00. The following sizes are available in continuous length coils: S-6-5, S-8-5, S-8-6, S-12-4 and S-12-6. Massachusetts sales add 6.25% sales tax. Prices include packing and shipping to USA. Inquire for quote to other countries. To pay with Paypal use my email above as my Paypal address and include the sizes and quantities you want with your payment. Or send me an email with your order details including your Paypal email and I will send you a Paypal request for payment. I can also email you a Google Checkout Invoice. Or mail a personal check payable to Steven Sorli. 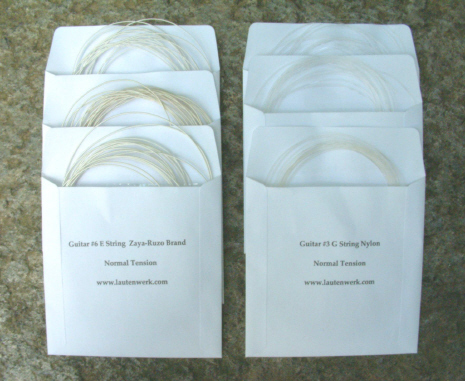 Five meter coils of the fluorocarbon strings are also available. Fluorocarbon (polyvinylidene fluoride) has a higher density compared to nylon. When replacing a nylon string with a carbon string use a smaller diameter. The bending stiffness is less and the string vibrates more easily. This emphasizes the upper harmonics and results in a more brilliant timbre. I will label these strings similar to the other suppliers with a number and KF. A 40KF string is a fluorocarbon (sometimes called carbon fiber) with a diameter of .40 mm. You can use this online calculator: Arto's String Calculator to choose the correct strings. Classical guitars use 60KF, 66KF and 81KF. The sizes available are 37KF $4.50, 40KF $4.50, 44KF $5.00, 50KF $6.00, 52KF $6.00, 58KF $7.75, 60KF $7.75, 62KF $7.75, 66KF $9.00, 70KF $10.50, 74KF $10.50 and 81KF $12.50. These prices are for 5 meter coils. Fluorocarbon treble strings are prone to slip at the tie block as can nylon. Before installing treble strings on classical guitars, hold the string tip above a match flame. The melted string tip balls up and prevents the string from slipping at the tie block. If a copper-wound string sounds too bright, you can easily tone it down with a product designed for protecting cork sandals. The product is "Cork Life" by Birkenstock. Take a small artist brush and apply a thin film on just one or two inches of the sounding length of the string near one end. Let dry 20 minutes before judging the results. You can also use Cork Life to remove the metallic brightness from fluorocarbon strings. You need to build up a thick globule near the bridge end of the sounding string about 1/8" long. You may need two applications with 1 hour drying time in between. The resulting sound will be nearly identical to gut. I do not recommend the new "Nylgut" made by Aquila Corde. It is not identical to gut in many ways. The sound of Nylgut is brighter than gut and does not have the "bloom" found in real gut and fluorocarbon. It is also considerably weaker than gut, especially the thinner sizes. I recently re-strung a Martin lautenwerk with Nylgut and had to tune the instrument down a half step to prevent string breakage. The coloring is much lighter than gut and some of the strings were bright yellow. The thickest sizes above .85 mm are useful and sound better than the equivalent fluorocarbon strings. Lastly, it is exorbitantly expensive. To make this knot, fold back the end of the string about two inches and squeeze the bend tightly with your fingers. Now form a 1/4" round loop of doubled string and position the bent end at the center of the loop. Use a jewelers screwdriver to catch the bent end and pull it through the loop. Pull string tight while holding the bent end with the screwdriver as a dummy hitch pin. The knot does not need to be close to the hitch pin position. I receive many inquiries about converting metal strung harpsichords into lautenwerke. It is possible to convert some harpsichords and many horrible sounding instruments can be transformed into beautiful lautenwerke. To determine if your harpsichord is a good candidate, you must look at the following details: 1.) If you have a 4' stop, you need at least 3/8" of clearance from the 8' strings to the top of the 4' bridge pins, especially in the bass. If not, the lute strings will slap and buzz against the 4' bridge. 2.) The close pairs of a 2 x 8' must not be less than 3 mm apart. You can move one of the pairs to a slightly lower level to gain more space as the strings can pass right through the bridge in tiny holes. 3.) Tuning pins with holes are much easier to string. 4.) Instruments with very short bass strings (including spinets and virginals) work well as lautenwerke. 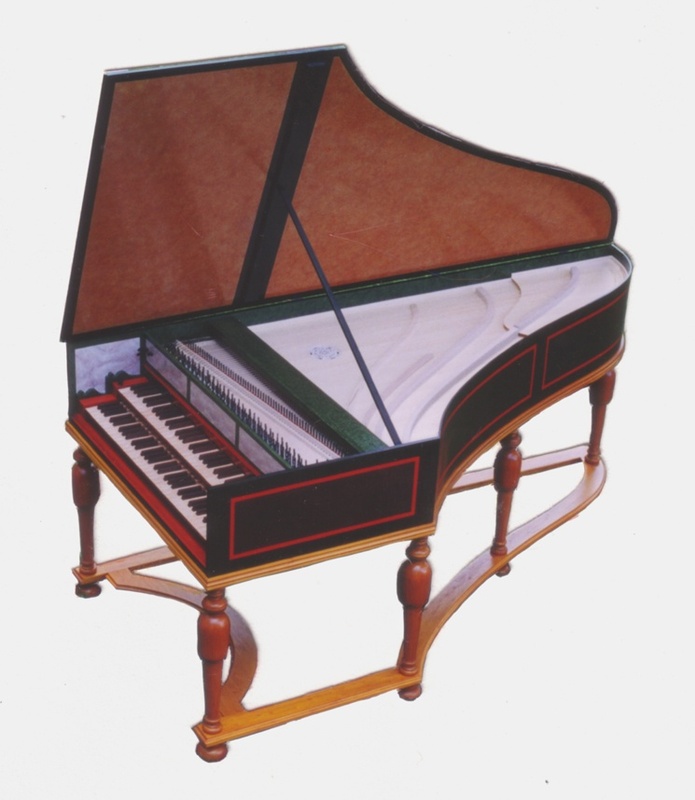 Some recent happy customers have converted a small Italian, an old Zuckerman spinet, a Zuckerman Z-Box, a Neupert Telemann single and a Hubbard spinet kit. I am now offering kits to make this conversion. The price is $400. for the first choir and add $150. for each additional choir. You will receive a stringing list for your instrument, all the strings needed and useful tools and instructions. I will need the vibrating lengths of all C's and G's, the length of the lowest note, whether your tuning pins have holes, the range of the keyboard and the pitch it will be tuned at.